Well, it's finally done. GURPS Time Travel never quite achieved the "project from hell" status that GURPS Space did, but the pain was stretched out over a much longer period . . . more than three years, and at least four different announced-and-missed ship dates. But it's done, it's in, it's printed, it's shipped, it's good, and I'm going to be much easier to get along with now. Which is good, because there's more to write. The article on p.3 covers one topic that I really wanted to cover . . . but couldn't fit into the book! And we'll be doing some spinoff projects. GURPS Timeline will be a full 128-page look at the interesting parts of human history, with lots of the best ones expanded into adventure seeds. And we'll also do at least one book of time travel (or cross-world travel) adventures. There's an excellent general look at the issues of constitutional rights in cyberspace in the current issue of Scientific American. The government has given its initial reply to our lawsuit. It's more stonewalling; it boils down to "We didn't do anything wrong, and if we did you're not hurt, and if you're hurt that's too bad because we have immunity, so run along." This was about what we had expected them to say. More news as it develops. As I reported last year, we're finally in the big book chains on a regular basis. 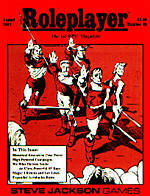 B. Dalton's has now picked up more than a dozen GURPS titles, and is genuinely working to keep the key ones in stock. Waldenbooks has fewer titles, but when they place an order, it's a big one. As predicted, neither chain wants to stock the whole line, so they're essentially creating more customers for the hobby stores, rather than competing for the existing ones. We're happy with the way it's working. Origins and GenCon were both great – thanks to everybody who stopped by, and huge thanks to everyone who helped run demonstrations. See you next year at Ori-GenCon.